The acclaimed Polish film Ida has met with controversy at home, facing criticism both for alleged anti-Semitism and for promoting a negative image of Poles. Notes from Poland discusses these lively political and historical disputes – which tell us a great deal about the healthy state of public debate in the country – while proposing a new interpretation of the film as a study of an individual’s unexpected emergence into freedom. Paweł Pawlikowski’s film Ida already has the look of a sure-fire Oscar nominee for Best Foreign Language Film, and perhaps even a favorite to win. Set in the early 1960s in communist Poland, the film tells the story of a novitiate nun in a dilapidated convent who learns on the eve of taking her vows that her family background is Jewish. Together with her alcoholic aunt, a communist judge and former prosecutor from the worst period of Polish Stalinism, the young woman journeys to her native village to uncover her roots and to find out what happened to her parents during the war. 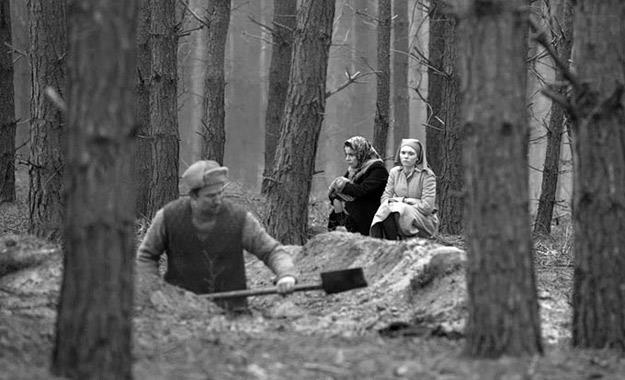 Ida has garnered high praise from critics all over the world, sweeping up prizes at the European Film Awards and moving The New Yorker‘s legendary film critic David Denby to describe it as “by far the best film of the year.” Yet in Poland, despite many positive responses, the film immediately became a source of controversy and a familiar battleground for familiar ideological opponents. A recent article in the daily Gazeta Wyborcza characterizes the interpretive conflict as yet another political clash between the Right and the Left. On one side of the barricade, conservatives like MEP Janusz Wojciechowski attack the film as an instrument of anti-Polish propaganda, depicting Polish villagers as primitive beasts bearing full responsibility for the Holocaust, while leaving the Germans entirely out of the picture. According to another public intellectual, Aleksander Nalaskowski, Ida is a film made “from hatred,” pandering to an international desire to paint Poland as an anti-Semitic nation. On the other side of the divide, critics associated with the Left – largely opinion writers for Krytyka Polityczna – have decried the film’s portrayal of a Jewish Stalinist judge, whose character supposedly confirms “a catalogue of the most vulgar anti-Semitic tropes,” including the insidious myth of Żydokomuna, or Jewish responsibility for communism and its crimes. 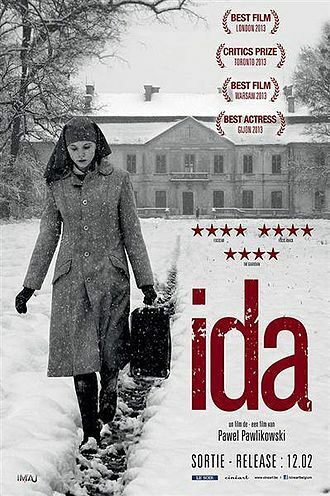 Between these two critiques, supporters of the film – like Krzysztof Varga – have suggested that all these tendentious interpretations entirely miss the point, since we should appreciate Ida as a powerful work of art about human individuals, and not merely as a vehicle for political opinions. Even more than most films, Ida seems to present a kind of cinematic Rorschach test, triggering opposite responses in different viewers. For Nalaskowski, the director errs by making the world of the film too ugly, reducing Poland to a noisome sewer, where hideous people do hideous things. Conversely, Agnieszka Graff complains that the film vacuously beautifies everything, even the ugly truth about Polish anti-Semitism. In between these interpretive extremes, Tadeusz Sobolewski insists that we should not “throw the baby out with the bath water.” Ida may have some dubious moments when it comes to political implications – and these are worth discussing – but its formal perfection represents a return to the golden age of Polish cinema. The presence of all these conflicting perspectives on the film points to both the robustness of public debate in Poland today and the highly sensitive nature of the material. The heart of the film’s political engagement lies in a peculiar and potentially risky operation. 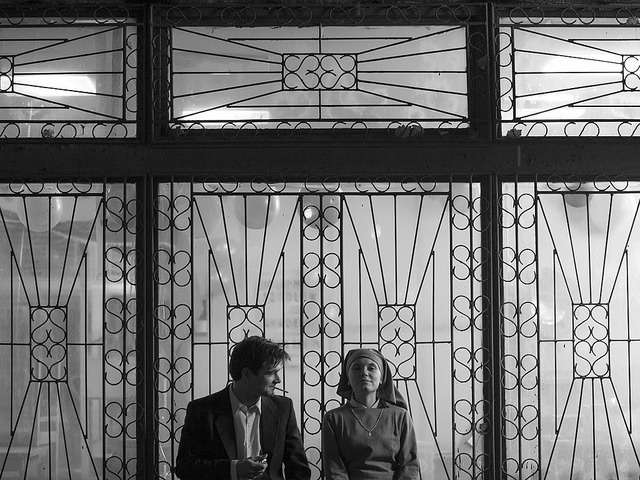 In short, Pawlikowski takes two stereotypical narratives and puts them into dialogue with each other. Each of these narratives is familiar, almost to the point of caricature, yet each contains a kernel of uncomfortable truth. The first involves ethnically Polish villagers murdering their Polish-Jewish neighbors in order to seize their property during the war and immediately after it. The second concerns the alleged “over-representation” of ethnically Jewish Poles in the Stalinist security apparatus in the late 1940s and early 1950s. It is true that some ethnic Poles murdered their Jewish neighbors, as Jan Tomasz Gross revealed in his 2001 book, Neighbors, though these criminals represented only a tiny minority of the ethnic Polish population. It is also true that people with at least some Jewish background made up a higher proportion of the Stalinist security forces in Poland than pure demographics would have dictated, though these individuals represented only a tiny minority of the country’s Jewish population, most of whom were the objects of oppression like everybody else (Stanisław Krajewski offers a nuanced discussion of these complex issues in an article published in Covenant: Global Jewish Magazine). In both cases, the actions of individual murderers, torturers and judicial executioners can only be understood, though not excused, through detailed knowledge of the direct historical context. In both cases, the kernels of truth have been distorted into grotesque myths collectively tarring ethnic Poles and Jews as homogeneous groups. Poles become murderous anti-Semites from their rough cradles, while Jews supposedly invented communism to torture the Poles. Ida‘s staging of a cinematic dialogue between these negative clichés is a very bold move. Some of Pawlikowski’s critics have accused him of introducing a deceptive equivalence between the two stereotypical narratives, making the ugly reality of opportunistic complicity with the Holocaust more palatable to a Polish audience by creating a false symmetry between “Polish murderers and Jewish criminals.” This sense of historical symmetry puts an end to any need for further soul searching on the part of Poles. Let’s just say we’re even, the simplified narrative goes: some Catholic Polish peasants might have behaved appallingly during the war, but then Polish Jews revenged themselves in the communist court rooms and interrogation chambers. Ida’s Aunt Wanda fits the stereotypical image of a Stalinist Jewish Fury – and a drunken, promiscuous woman, to boot – who took bloody revenge for her murdered family on innocent Poles in the show trials after the war. When she commits suicide late in the film, this terrible chapter of history is closed, and we are left with Ida herself, a character whose Jewishness is diffused or even extirpated by her adoration of Christ and her implied decision to return to the Catholic convent at the end of the story (in fact, the final scene may be more ambiguous than this interpretation suggests). Her faith also opens the film to the additional charge of “Christianizing” the Holocaust. Meanwhile, the Polish murderers have legitimated their ill-gotten gains through a deal with the young novitiate: we show you where your family is buried, and you renounce all claims to your property. So everything is settled. The destructive Jewish Stalinist destroys herself after confronting the pain of her past. Ida returns to the fold of the Church that saved her life as a child. The penitent Poles retain the stolen property after digging up the remains of their murdered victims to be reburied in a Jewish cemetery. According to Helena Datner and Agnieszka Graff, the artificial symmetry of guilt and the symbolic neatness of the plot make the film comfortable for a Polish audience, pandering to the “self-satisfaction of the majority” and suggesting that “Poles have had enough of the hard work on collective memory.” Elsewhere, Graff accuses the film of attempting to escape from the mud of history and politics into ethereal realms of the beautiful and the sacred. Thus, the film’s most suggestive images are a statue of Christ and the sun shining through a stained-glass window incongruously installed in a dirty cowshed. All these critical arguments hold some water. More generally, they reflect the lively debates currently taking place in Poland, some of them on the pages of mainstream daily newspapers. Historical self-reflection in the country has reached a high level of sophistication and penetration. The lack of consensus reveals an entrenchment of political positions, but it also suggests that a variety of perspectives might still be required to fully explore the central questions of collective guilt and responsibility in all their complexity. At the same time, the debate exposes deeper anxieties associated with Poland’s image abroad and the unresolved question of Jewish property. Though these analyses are perceptive and intelligent, I am still more inclined to side with the “aestheticist” voices praising the film’s merits in the face of its alleged political deficiencies. Pawlikowski is so successful with his sensitive portrayal of a conflicted character in a complex world – where “everybody has their reasons,” as he puts it – that some on the Right have attacked the film for white-washing the crimes of Stalinism by making the character too sympathetic. According to this view, she appears more as a victim than a perpetrator. The victims of her crimes have no voice, so her own status as a casualty of historical circumstance is unjustly foregrounded. If we must focus on political and historical interpretations, then this viewpoint is potentially just as valid as any critiques of the character as an anti-Semitic stereotype. Yet this equal validity also exposes the inadequacy of both arguments. For how can Wanda be purely an anti-Semitic stereotype cut to an image that appeals to conservative Poles when conservative Poles have found her portrayal so deeply dissatisfying? And how can the film be guilty of expunging Stalinist crimes from the historical record when critics on the Left have been so outraged at the false parallelism forged between murderous Polish greed and Jewish Stalinist revenge? Perhaps all these contradictory critics are right. Perhaps all of them are completely wrong, imagining things that aren’t really there and imposing their own ideological phobias on the material. Perhaps the film simply doesn’t go far enough in any particular direction to satisfy dogmatic interpretations. Pawlikowski himself expressed the hope that his work might be “sufficiently specific and un-rhetorical enough to be understood on its own terms.” In the case of Wanda Gruz, he has surely succeeded. Wanda idealizes nothing – certainly not her own past – yet subtle signs of overpowering love for her newfound niece and her dead sister periodically break through a cynical exterior in flashes of emotion, almost in spite of herself, suggesting very different possibilities for her life in different historical times. Kulesza plays these moments to perfection, freezing with shocked recognition when Ida first appears or lowering her defences with a tender smile as she later observes the younger woman sitting alone through the window of a bus station waiting room. The warmth and understanding that builds between the two women, none of whom is effusive with her emotions, forms the heart of the film. But what about the negative image of the poor Catholic Poles? We have seen a recent cluster of films dealing with the ghosts of Jewish Poles murdered by their neighbors during the war – the most well-known and controversial being Władysław Pasikowski’s Aftermath (Pokłosie, 2012). This makes the story of Ida’s parents, their murderer and the almost obligatory scene in the pit of a shallow grave feel like very familiar territory. In any case, no such scene can equal the impact of Polish-Jewish writer Henryk Grynberg’s real-life return to the scene of his father’s murder in Paweł Łoziński’s stunning documentary film, Birthplace (Miejsce urodzenia, 1992). This film alone provides enough evidence to prove the basic truth of Ida‘s narrative of murder and subsequent suspicion of returning Jewish survivors. Yet international audiences have undoubtedly seen or heard this story before, and it potentially misrepresents the broader picture of Polish-Jewish relations during and after the war. So does Pawlikowski complicate or explore this cliché, as he does the image of a Jewish Stalinist? Perhaps not so much. We don’t learn a great deal about the ethnically Polish murderer or his family. We see grinding poverty, misery and fear, which might evoke compassion for their plight, though rather in the form of shuddering pity for benighted beasts. The last time we see the murderer, he is cowering in the empty burial pit, head bowed in penitence, confessing the ugly truth to the daughter of the people he has killed. Paradoxically, he also reveals that he saved Ida’s life by giving her away to the local priest. For the warring critics, this scene is either too cheaply cathartic or potentially libellous in its insistence on Polish guilt. 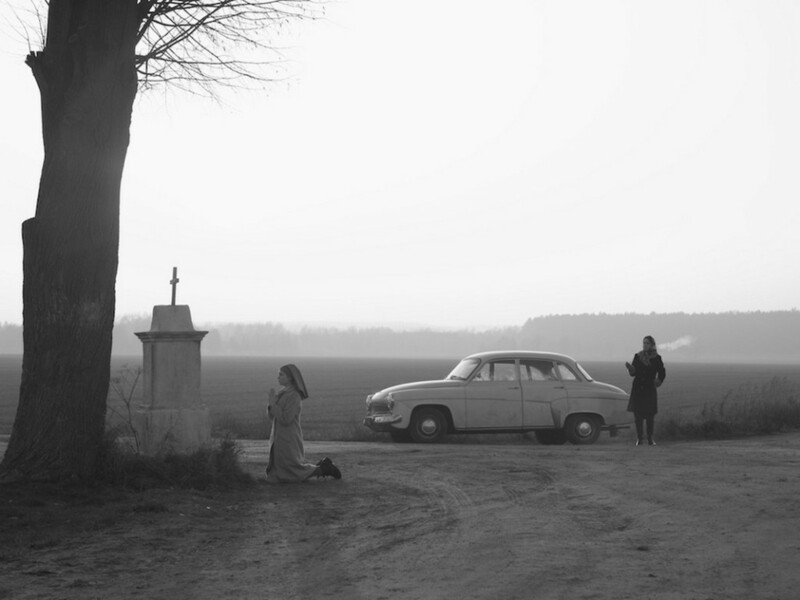 I would argue that Pawlikowski simply doesn’t do enough with this section of the story, using it almost perfunctorily as a ready-made plot element, familiar from other tales, when he is much more interested in Ida’s present journey than in her past. Nevertheless, the image of Poland as a whole is more nuanced than the village scenes would suggest, thanks largely to a handsome jazz musician and his band, who blow into the film as if from another world. Here, we see the culturally sophisticated Poland from after the “thaw” of 1956, when the country witnessed an extraordinary blooming of cinema and jazz music. This rich cultural moment sets the aesthetic for certain parts of the film, which are sometimes reminiscent of Andrzej Wajda’s classic, Innocent Sorcerers (Niewinni czarodzieje, 1960), with its black-and-white images, introspective jazz soundtrack and unlikely lovers thrown together by chance. According to Pawlikowski: “My country may have been grey, oppressive and enslaved in the early 60s, but in some ways it was ‘cooler’ and more original than the Poland of today, and somehow more universally resonant.” Poland is not so ugly, after all. In Pawlikowski’s hopes for both “specificity” and “universal resonance,” we perhaps find the source of some of the controversy. 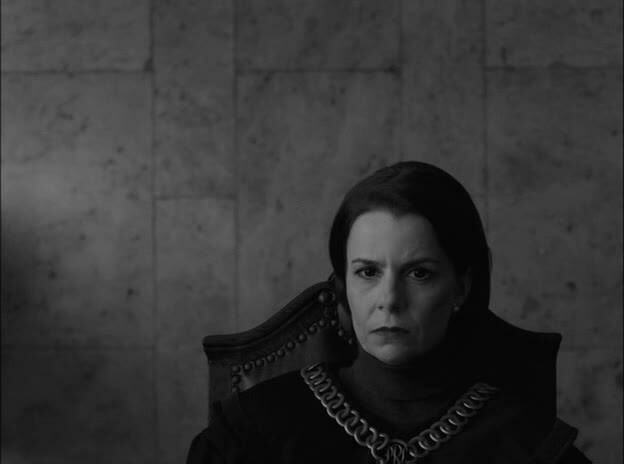 Ida negotiates awkwardly and inconsistently between the universal and the particular. There are moments when the particularity of individual human beings and their fates emerges so strongly as to drown out any excessively generalized or historical interpretations. 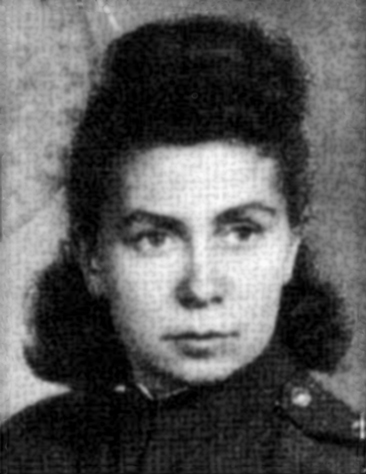 Wanda Gruz does not represent Jewish Poles. She does not really represent anything at all (here I would disagree with Majmurek’s claim that she embodies “the entire tragedy of communism”). Agata Kulesza brings the character so vividly to life that Wanda Gruz is, above all, simply herself, an individual human being caught in her own individual way inside the dehumanizing and universalizing mess created by two totalitarian political systems. However, there are other moments when the film paints in broader brush strokes that simplify and generalize, as in the less imaginative representations of the Polish villagers. At the same time, the symmetrical “universality” of sin might appear to erase the particular meaning of what these people have done to Ida’s family. 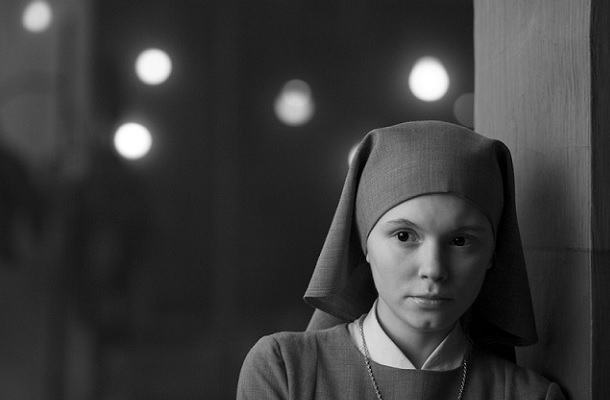 Most important of all, as many critics have noted, the character of Ida herself is frustratingly elusive, never developing into anything more concrete than the flat image of a novitiate nun who discovers she is Jewish – an enigmatically beautiful surface with no sense of depth. Yet this is clearly Pawlikowski’s intention, and, in my opinion, the positive core of the film. Some interpreters have described Ida – played by Agata Trzebuchowska – as a “blank slate.” Of course, this is a projection based largely on her illegible face, since her mental slate is presumably filled with the religious lessons she has absorbed at the convent – at least, until she discovers her true origins and meets her aunt. This is just where Ida gets fascinating, as the main character enters a new realm of expanded freedom in which identity becomes a very fluid concept. She still remains attached to her faith, praying and speaking to a statue of Jesus in the middle of a muddy field. Yet she also begins to attain an unmistakable sense of distance from her identity as a nun in training, a new spirit of uncertainty that betrays itself in a suppressed giggle during a silent communal meal at the convent. When she leaves the community once again to deal with Wanda’s effects after the suicide, we see Ida trying on a new identity in her aunt’s empty apartment, finally shedding the novitiate’s habit that seems almost to have shielded her from the world. First, she models one of her aunt’s elegant dresses, teetering awkwardly across the parquet floor in high-heeled shoes. Then she smokes a cigarette and swigs from a bottle of hard liquor in front of a mirror, inspecting her new identity with fascination. Finally, she experiments with physical love with the handsome musician. The next morning, as the young man dozes in her aunt’s bed, Ida rises, puts on her habit, and walks out. The mysterious closing scene shows her striding towards the camera down a country road, perhaps on her way back to the convent, perhaps embarking on another journey into the unknown. Whatever her destination, the key point is that Ida has chosen for herself. More than that, she has been afforded a luxury that few ever receive – the capacity to shape her own identity. In these extraordinary moments of existential freedom, she faces a multi-pronged fork in the road. She can forsake the convent and embrace the faith of her parents. She can join the secular world with no strong religious attachments, touring the country with her saxophonist and his band. She can adopt any number of hybrid identities in between. Nobody will force her to take her vows. Nobody will force her to be Jewish. She is free. She must decide. Of course, this choice does not arise in a vacuum. She has been raised in the Church, so the Christian version of her identity is likely to win out – which, apparently, it does, at least for now. Yet what she has experienced will ensure that life in the habit can never seem uncomplicated again. She has seen the bones of her parents exhumed from the earth by a Christian who was able to kill them with impunity because they were Jewish. She has entered the alien world of her aunt, whose Jewishness does not appear to have carried any great significance for her own identity after the war (Wanda is buried in a secular ceremony with the honors of the communist state). Ida discovers that one’s ethnic or cultural background might not have anything to do with how one feels or what one believes. She still attaches her devotions to Christ, but her gestures and prayers seem stiff and conventional, as if they were merely provisional outward forms to conduct an inexpressible inner need that far exceeded them. No sense of social identity can ever be natural for her again. Admittedly, Ida receives this gift of choice because she is an orphan, robbed of her parents’ culture by an act of murder and the silence of those who brought her up in the Church. In this sense, her freedom to reject her Jewishness can be nothing but a terrible tragedy, since it is only possible thanks to the original loss. Indeed, her apparent decision to forsake her roots has provoked the ire of critics who view the film as anti-Semitic. Yet perhaps there is also something triumphant in Ida’s almost steely stride towards the camera in the final scene. Whatever her reasons, whatever she has chosen, whatever the circumstances that led her there, Ida has consciously determined her own destiny, with full appreciation of the alternative possibilities open before her. In my view, the “spiritual” content of Pawlikowski’s film lies in an untouchable core of human personality that remains impervious to the claims of society, culture or ethnicity, or at least to the rigid understanding of them favored by racists, religious fundamentalists and totalitarian regimes. Perhaps “core” is the wrong word, since so much of this essence resides in externalities, on the surface, as it does in the inscrutable contours of Ida’s face, her stiff gestures and the brittle tension of her thin voice. All these unique elements of an individual human being can be shaped by cultural conditioning and even by the physical characteristics of race or ethnicity, but there is always something else that escapes – the most essential part. Ida is an attempt to capture this external essence. To borrow crudely from Joseph Conrad, the meaning of Ida’s individual existence is “not inside like a kernel but outside, enveloping the tale which brings it out only as a glow brings out a haze, in the likeness of one of these misty halos that sometimes are made visible by the spectral illumination of moonshine.” We have no access to Ida’s internal world, but the strange “halo” of her personality permeates the entire film, even if one would struggle to define it with any sensible words. 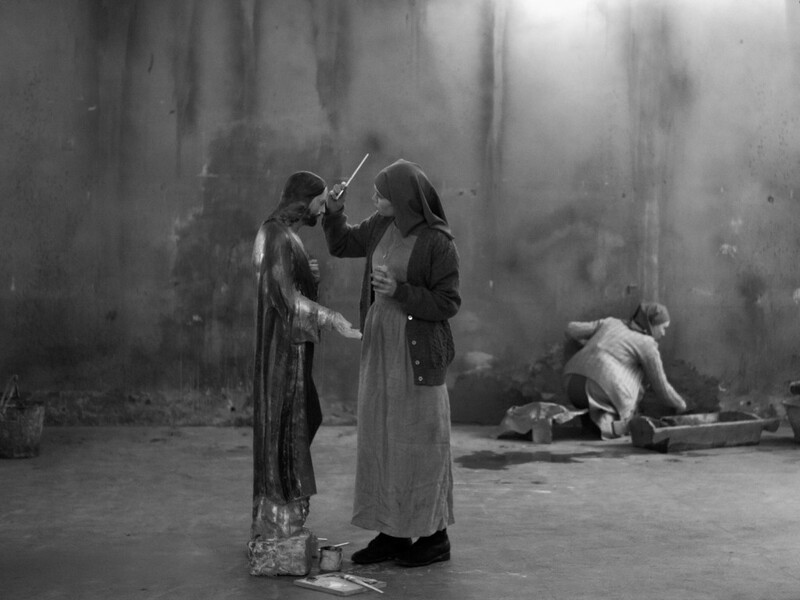 Ida unfolds in an imperfect but haunting interplay between surface and depth, stereotype and unique human destiny, stained glass and dirt. At the heart of the tale is the uncertain prospect that a person can choose who she is and what she stands for in accordance with an indefinable “halo” of individual identity that evades the tyrannical determinism of culture, ethnicity, society and history. Inevitably, the main character’s potential ways of being can only multiply through the new social realities she encounters. She is not magically free to shape her identity without any reference to concrete experience. Yet even this modest expansion of the possibilities awakens an intuition of something within her that cannot be contained by social or historical categories, an elusive thing that itself has taken various names in different places and at different times in history – the soul, the spirit, the self. 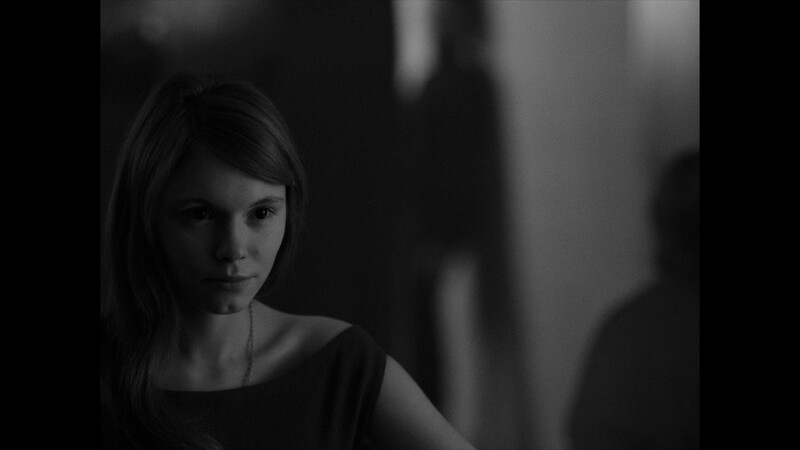 Whichever word we choose to use, Ida senses its presence, and Paweł Pawlikowski’s film would have us believe that it exists. Piękny, poruszający najgłębsze zakamarki ludzkiej duszy czarno-biały film o Polsce lat 60 stalinizmie i gdzieś tam w tle o trudnych relacjach polsko-żydowskich, (bo tak naprawdę sam film jest tylko osadzony w pewnych realiach). W głównej mierze jest to film religijny- myślę, że takie było założenie Pawlikowskiego – film o potrzebie wyciszenia się, odsunięcia od świata, kontemplacji, ale przede wszystkim o szukaniu własnej tożsamości, wierze i dojrzewaniu, w dużej mierze o poplątanych ludzkich losach, ludzkich słabościach. Pawlikowski stworzył film medytację, formę, w której widz nie jest zalewany informacjami, obrazem, który nic nie tłumaczy, ale sugeruje. Pułapka a zarazem siła filmu polega na tym, że prawie wszystko musimy dopowiedzieć sobie sami. Jakiś czas temu, ale już po rozdaniu Oskarów, oglądałam wywiad z Cezarym Harasimowiczem, który był współautorem początkowych wersji scenariusza. I co ciekawe w pierwotnej wersji film miał nosić tytuł „Siostra Miłosierdzia” nie „Ida” i w tym tytule byłaby jakby kwintesencja tego, o czym ten film jest. Pawlikowski chciał opowiedzieć historię osoby- na początku to był ksiądz- mężczyzna. W „Idzie „ bohaterką jest siostra zakonna, która wychodzi na „krótki urlop”, żeby poznać życie za murami klasztoru-poznaje świat dosyć intensywnie, bo pierwszy raz jest z mężczyzną, dowiaduje się, że jest pochodzenia żydowskiego i cała jej rodzina zginęła z rąk Polaków, bandytów, co było jednostkową sprawą-, po czym wraca z powrotem do klasztoru w imię miłosierdzia. I była jeszcze jedna scena, która została wycięta, ta dramatyczna scena rozmowy z „katem” w lesie- w początkowej wersji scenariusza była taka prośba o przebaczenie, kiedy zwraca się do Idy słowami – „ tylko ty możesz sprawić, że mój grzech będzie odkupiony”. Pawlikowski jednak w ostatecznej wersji jakby wydestylował tą całą historię. Od samego początku Pawlikowskiemu nie chodziło ani o film historyczny ani publicystyczny. Nie jest to film, który krzyczy – tak jak krzykiem było „Pokłosie”. Dla mnie wielkością tego filmu jest to, że jest odważny, nieoczywisty, kameralny. Obejrzałam go jak album ze starymi zdjęciami, jest jak poezja która mnie poruszyła…..
Filmy takie jak ten skłaniają do przemyśleń, zachęcają po raz któryś do sięgnięcia w głąb naszej historii. Wracając jeszcze do naszych wspólnych losów polsko-żydowskich, które w filmie stanowią pewne tło – to, co jest najważniejsze to to, że Żydzi to część polskiej kultury, to także Polacy. Zapominamy o najbardziej istotnym szczególe – jak wiele z judaizmem ma wspólnego chrześcijaństwo – żadne inne religie nie są sobie tak bliskie. W ostatecznym rozrachunku, myślę, że Żydzi doświadczyli wiele dobrego od Polaków, ( mimo, że nie wszyscy w tamtych strasznych czasach umieli pokonać strach, niektórzy nie zdali egzaminu z odwagi, współczucia i zwykłej ludzkiej przyzwoitości), o czym świadczy artykuł, na który natrafiłam przypadkiem szukając informacji na temat andrychowskich Żydów, a który miło się czyta ze świadomością, że są jeszcze osoby, które potrafią powiedzieć o Polsce i Polakach wiele pozytywnych słów: https://astromaria.wordpress.com/2013/05/23/brazylijski-zyd-broni-polakow-przed-oszczercza-kampania-nienawisci-2/ – wart przeczytania w wolnej chwili, polecam. „Pierwszego dnia (po zamknięciu getta 15 XI 1940) mnóstwo chrześcijan przyniosło chleb dla swoich żydowskich przyjaciół i znajomych, było to masowe zjawisko. (…) Dziś, 19 XI 1940 zastrzelony został chrześcijanin, który przerzucił wór chleba przez mur. (…) Słyszałem od Żydów z Głowna, że (tamtejsi chłopi utrzymywali ich przez całą zimę. Nie było wprost wypadku, aby Żyd wyruszył na wieś i nie wrócił stamtąd z workiem ziemniaków”.